We had a wonderful Victoria Day weekend up the lake. When we arrived, the first thing we did was check out back. In addition to wood chips on the deck there was now pink insulation. Obviously our reflective device and boarding up the hole didn’t do the trick. John’s mother, Helen, suggested painting large yellow and black owl eyes. 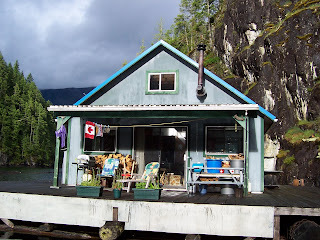 This tactic worked when there was a woodpecker invasion at John’s #1 cabin. 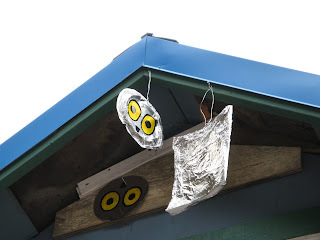 We got out two aluminum pans and my paints to quickly create two scary owls. Wayne went back up the ladder and to nail up more boards to recover the hole and install the two guard owls. For the rest of the day, all was quiet. At 5:30 the next morning we heard someone knocking. We get unexpected guests at our cabin, but never at this ungodly hour. Obviously, this woodpecker isn’t afraid of owls, at least the aluminum pan variety. And now there are two, one sitting watch on the roof and one doing the drilling. Nest building is in full swing, and it seems that no other place will do. We spent the rest of the morning shooing our uninvited guests away. When there was no more activity in the afternoon, we thought we had won. But at 5:30 the next morning they were at it again, hammering away. At least long enough to wake us up to shoo them away. Back up the ladder Wayne went. This time we nailed another aluminum pan over the hole and two more to hang in front to discourage landing. 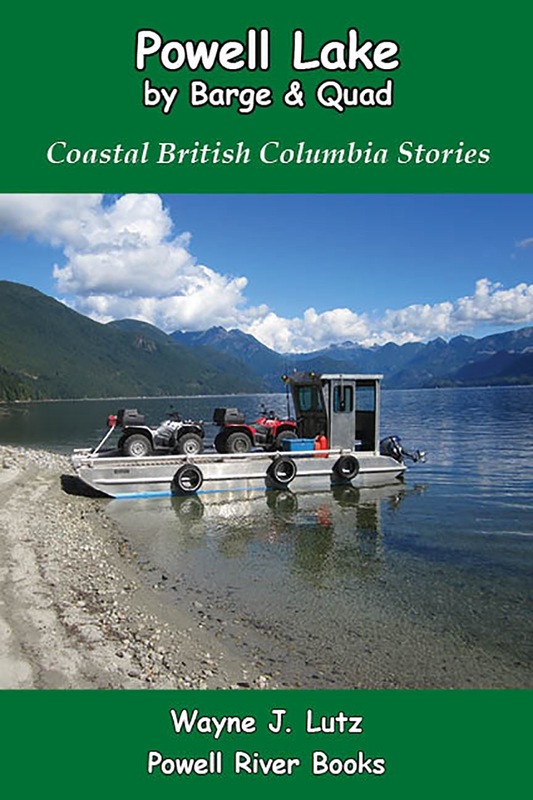 Now a little of the “not so good.” Each late spring when we return to our float cabin on Powell Lake we find a different challenge. Two years ago it was a nursery roost for Small Brown Bats between our ceiling and metal roof. Fortunately they couldn’t enter the cabin, but we could hear them exit each night and re-enter just before dawn. Sleeping late that summer wasn't easy. Last year we returned to find lots of Deer Mice living under our deck. One evening we could hear them scurrying in and out through a crack by the screen door. It took several trappings to get the last of the cabin occupants evicted. New year, new challenge. We had just arrived and were putting our groceries away. There was a loud rat-a-tat-tat coming from the back of the cabin. Someone was knocking, but not on the front door. We went outside and around the corner of the float. 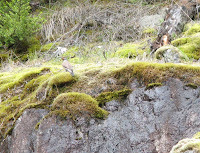 Wayne got there first and saw a fairly large bird flying away towards the cliff. A visual inspection of the deck gave us our second hint. There were wood chips and slivers littering the boards. A look up towards the eves confirmed our worst fears. A woodpecker had chosen our cabin for her nest. Since there wasn’t a hole ready for occupancy, she was making one of her own. We caught her just in time. 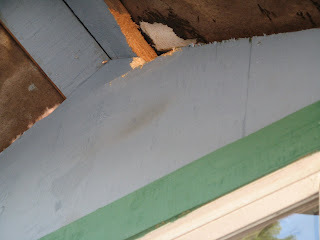 An exposed beam was shredded, but entry under the roof had not been achieved. 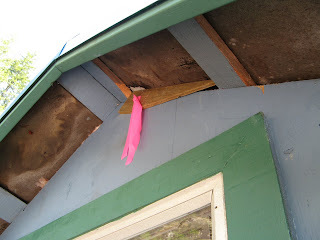 Wayne used some wood to block the hole and hung bright pink trail marking tape to flutter in the breeze. There was no sign of her for the rest of the day. The next morning at 5:45 a.m. we heard it again, rat-a-tat-tat. The eves are just over our upstairs bedroom window, so a loud “shoo” got her going back towards the cliff. An hour later, it was the same thing again. We didn't have a metal pie plate, so Wayne got a thin board and covered it with aluminum foil. We suspended it in front of the hole. Unfortunately, we had to return to town, so we won’t know if it was enough of a deterrent until we return today. Here’s hoping!! 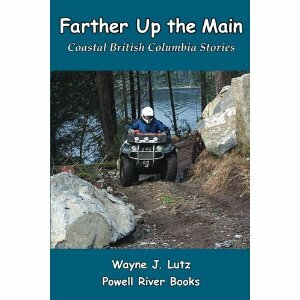 Today we returned to Powell River (CYPW) in 997. It was good to be flying again. Our departure out of Bellingham International (our US home base) took us over the San Juan Islands and across to Victoria. 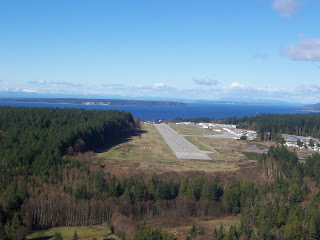 Our first destination was Campbell River Airport (CYBL) to clear customs. Wayne called ahead to make the arrangements for entry with CANPASS. Powell River with Powell Lake in the background. After only a few questions, we were issued a clearance number over the phone. It is a really efficient system and I would recommend it if you fly to Canada with any frequency. 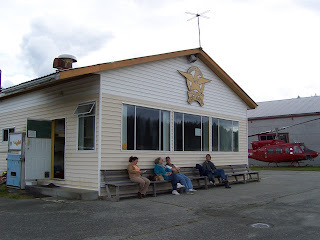 We flew into Campbell River and waited until our designated arrival time. 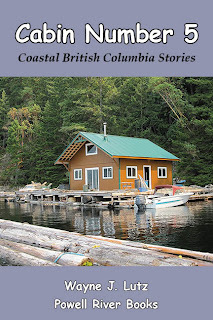 No Customs officials came to meet our flight, so we were free to continue on to Powell River. 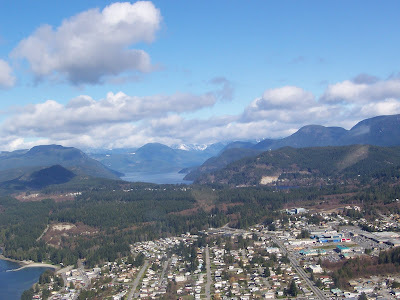 We chose to fly using a Flight Itinerary having notified a responsible person (Helen, the mother of our good friend John) in Powell River of our flight plan and intended arrival time. Crossing the Strait of Georgia took 30 minutes and we were back in our parking spot at the Westview Flying Club. There are times when we just can’t make enough electricity with either solar or wind power. We really try to rely on renewable power sources, but on occasion we need to use a generator to give our batteries a good charge. If they drop too low, especially in the winter, it is very difficult to get them recharged high enough to begin using our electrical system again. We purchased a small portable Coleman generator. There are two AC plugs and DC cables to connect to the storage batteries. It will run for about 7 hours on a tank of gas and allows us to recharge our computers at the same time our storage batteries get a needed boost. It's an inverter generator which is better to use with electronics. The generator also comes in handy for power tools. 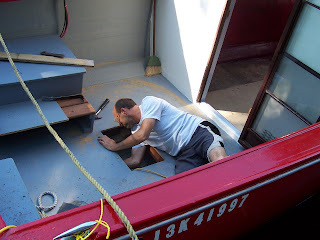 When the Gemini sprung a leak last summer, John had to cut a hatch in the deck to reach the hole. Without our Coleman, we wouldn’t have been able to do the job. Today, there are quieter and more fuel-efficient models. We have been looking at the Honda EU2000i. But for now, our Coleman does the trick. Besides, we only need it in the winter when we are the only inhabitants in Hole in the Wall. Our first solar panel in 2001. The first summer we depended on propane for cooking and battery powered camp lights for illumination (we didn’t yet trust our propane lights). We had to take our computers to town for recharging. Having some electricity at the cabin would be nice, so we consulted with our good friend John and his dad Ed, the electrical genius of the family. 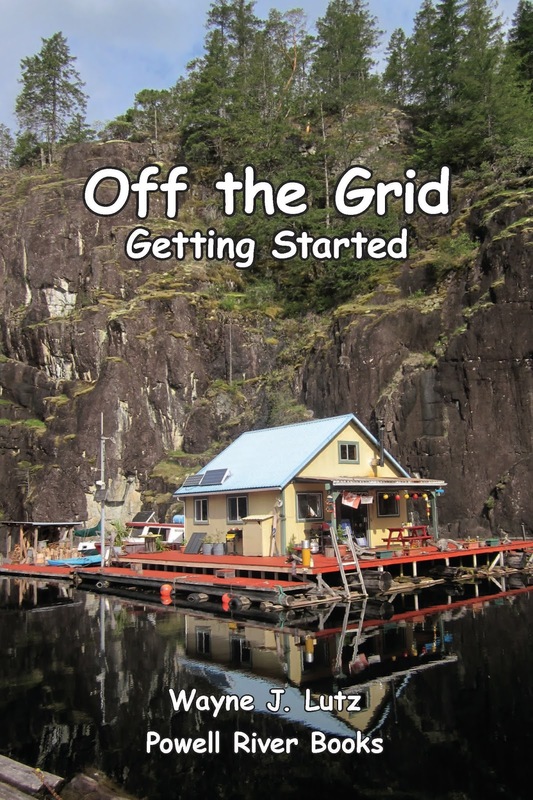 Since we are off-the-grid, their recommendation was solar power. Our electrical closet with two batteries. 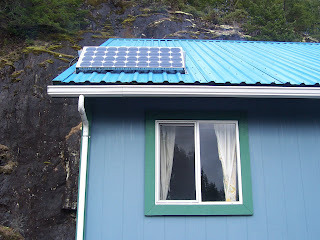 By fall we had a solar panel with two batteries for storage. An inverter changed the DC current of the batteries to household AC. 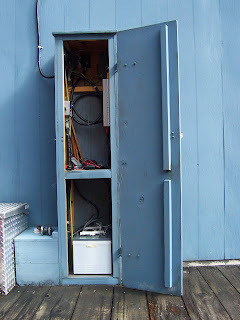 John built an outdoor cabinet for the batteries and inverter, and linked it to an inside meter and cutoff switch. Lights and outlets were placed in the bedrooms, dining area, kitchen and over the sofa. Now we had to learn how to manage our electrical system. In the winter the sun rides low and due to our position in Hole in the Wall, we get as little as four hours of direct sunlight. Winter also has many cloudy days when no power is generated. We quickly learned it is important not to drain the batteries below 12.0 volts. Otherwise, it is impossible to get them to recharge properly. Propane chandelier and fluorescent light. 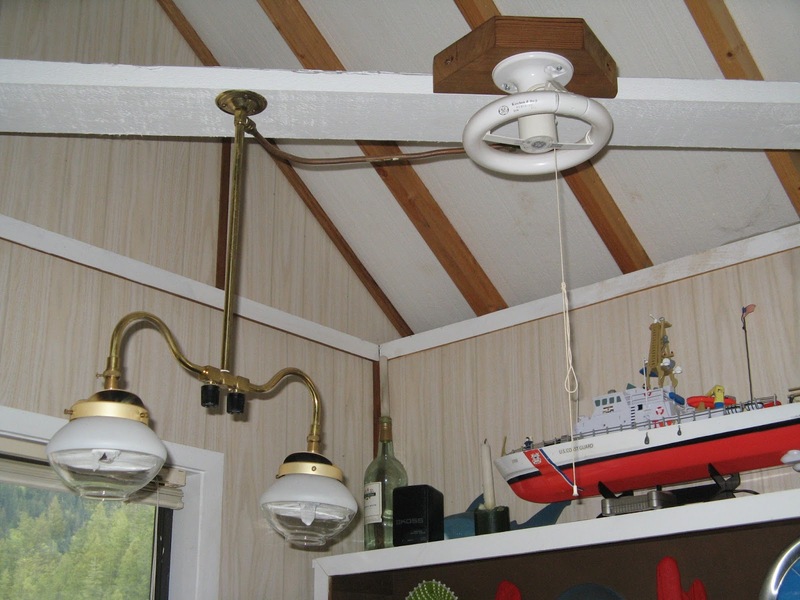 To stretch our electrical budget, we use low wattage compact fluorescent light bulbs. We limit usage and augment lighting with our propane chandelier (now we love it). Rechargeable battery powered reading lights also help. We use rechargeable devices rather than disposable batteries whenever possible to help the environment. Our computers are real electricity hogs. We only charge them and other electronic devices during sunny periods. We also purchased emergency power packs to charge during peak sun hours. They are used for extra computer power on cloudy days or during the evening. Gemini with her solar panel on top. One panel and two batteries didn’t provide much electricity our first winter. We added two more storage batteries. Then, we added a second solar power system on Wayne’s writer’s retreat boat called the Gemini. 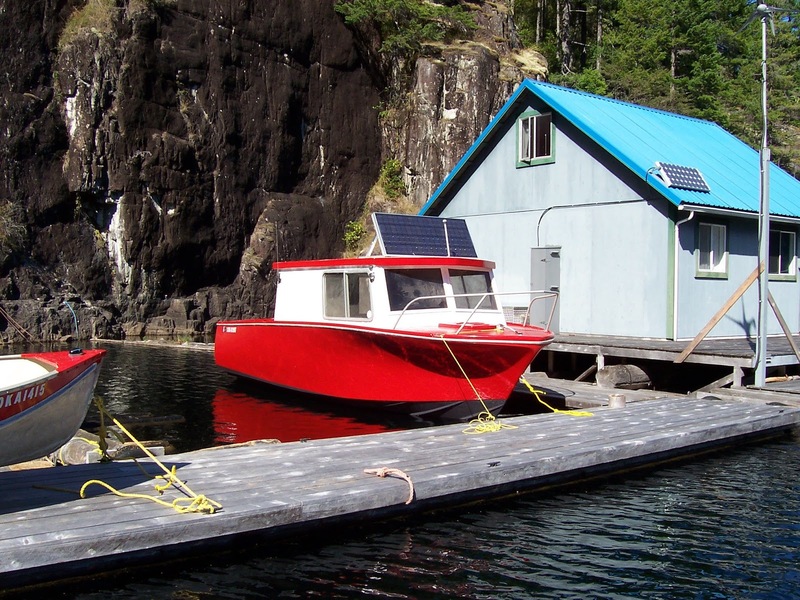 A toggle switch allows us to divert the electrical power from the boat to the cabin.